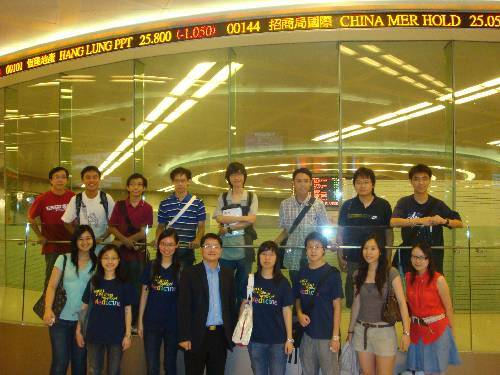 On 11 Jun 2009, Dr. Wilton Fok led a class of medicine students to visit the Hong Kong Exchange. This field trip is part of the Special Study Module on “Engineering Economics and Finance for Medical Professions” specially offered for the students from the Li Ka Shing Faculty of Medincine. During the visit, students learned the history, evoluation and current operation of the stock market and future market in Hong Kong. Besides, students also learned basic economics, finance and accounting skill from the course such as techniques for the evaluation of effectiveness of an investment of medical equipment, accounting for private clinic and different financing models of medical services.